Charles Lyster’s greatest drive has always been adventure, and over the last 30 years he has climbed, travelled or sailed in Europe, Scandinavia, South America, Africa and Central Asia. He worked for Outward Bound Wales for a number of years (where a favourite group activity was sailing dipping luggers) before becoming Chief Instructor at Outward Bound Chimanimani in Zimbabwe in the late 1980’s. He then trained, first as a carpenter, then as a cabinet-maker and worked for twelve years as a designer and maker of fine furniture. Never satisfied with a single career, he simultaneously set up and ran the cancer charity Odyssey, which uses adventure in the outdoors to enhance quality of life for adults with cancer. In 2001 after being inspired by the beauty of the traditional small craft of Norway he built his first faering; he has since bought the classic wooden yacht ‘Driac’ - built in 1930 - which he is gradually restoring (with suitable pauses to enter her in the Three Peaks Yacht Race). He is married to the classical singer Catherine King and they have two teenage children. Charles has sailed his own faering, ‘Yggdrasil’ widely. She has been to Cornwall, the Lake District, North and Southwest Wales, Brittany, Norway and the West coast of Scotland. As he has discovered the extraordinary ability of these fragile-seeming boats to stay on top of the water he has become more adventurous and has spent up to ten days sailing and rowing among the Scottish islands, bivouacing in the heather at night and feasting on fresh fish cooked on the beach. The ability to trail the boat anywhere behind an ordinary car puts adventure within reach at a moment’s notice. Charles has sailed in a great variety of vessels including modern fibreglass and steel yachts and dinghies but he has always been most drawn to vessels which are either genuinely old or which are traditionally built; boats which have character and atmosphere seeping from their very frames. 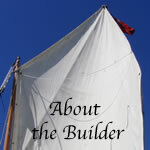 He has sailed dipping lug cutters, Thames barges, a Dutch Tjalk barge, and a gaff-rigged trawler as well as his own faerings and his pre-war yacht. It is the journey which creates the satisfaction, the sense of exploration, of finding somewhere new. Each boat can do this on the scale appropriate to its size and capabilties.